3-IN-1 Auto Assist Handle Just $12.99! Down From $32! Ships FREE! You are here: Home / Great Deals / 3-IN-1 Auto Assist Handle Just $12.99! Down From $32! Ships FREE! 13 Deals has this 3-IN-1 Auto Assist Handle on sale for $12.99 (Reg. $32)! Now you can get in and out of your car with ease. This new portable handle locks instantly into the door latches of any car. Simply open your door and snap it on! 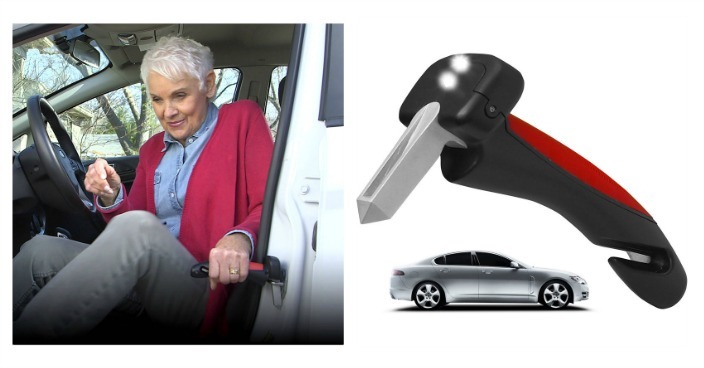 3 in 1 auto safety handle locks into place and will not move. Nonslip grip is comfortable to hold. Gives you the leverage to lift yourself up. Forged aluminum construction can hold 350 lbs. Features a seat belt cutter and glass breaker in case of emergencies. Stores away easily in your door or glove box. Gives you a handy grip so you won’t slip on those icy days. Built-in flashlight .